When the Romans came to Britain they brought with them designs for bread ovens. These typically featured a roof of rubble and tiles, and a flue in front and were fired with wood or charcoal. 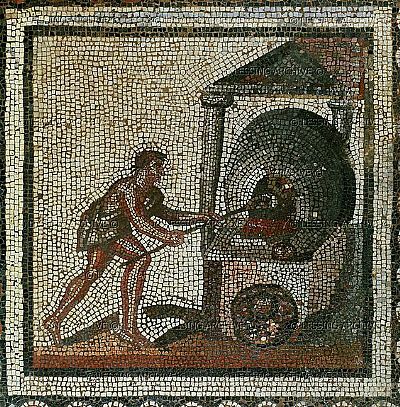 The image left is of a Roman mosaic, depicting putting bread into an oven, from the the third century. The image on the right is a clay figurine kneading dough in a trough, from the cemetery at Achzib (mentioned inJoshua 19:29 - 31. 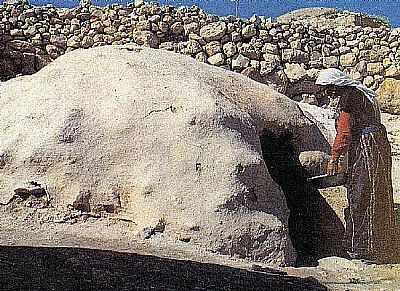 The image on the left shows baking bread in a taboon, a clay-lined oven in which the dough, spread very thin, is placed on a layer of heated pebbles and taken out almost immediately, baked. For centuries, bread ovens of this type were common throughout Britain. Typically they were built of bricks and fuelled with wood. The bricks gave them a large thermal mass which meant that they retained their heat after their fire had gone out. 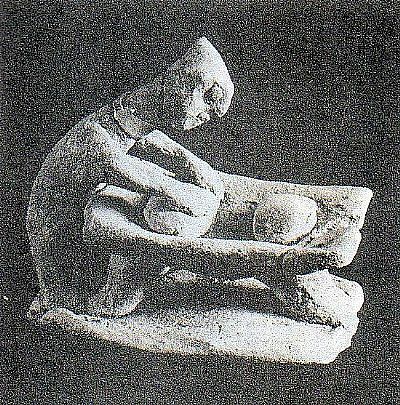 Thus, from a single firing they could be used to cook a range of items as the heat slowly diminished. 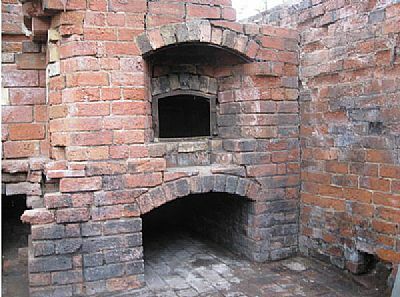 To be most effective, brick ovens were relatively large, so their size and cost of construction meant they weren’t suitable for use by individual households. Consequently, communal brick bread ovens (bakehouses) were built for use by groups of villagers. These were periodically fired up and, for a small charge, villagers brought along their loaves, pies and, in some cases, their Sunday dinners, to be cooked in the communal oven. Cast iron stoves became more prevalent in the eighteenth and nineteenth centuries. However they didn’t totally replace communal bread ovens since they were fired continuously and were too large for most domestic kitchens. It’s only during the last hundred years or so that people have cooked with smaller ovens powered by gas or electricity. Together with the wide availability of ready-baked loaves, the traditional communal bread oven has been rendered obsolete. Traditionally fired using wood as fuel, bread ovens retain heat due to their large thermal mass (thickness and type of the masonry), so that even after the fire has subsided in the oven, the heat is retained allowing many hours of baking from a single firing. With its large stone hearth and its specially constructed brick dome, the bread oven combines all three methods of heat transfer (convection, radiation and conduction) in the most efficient way possible whilst retaining the natural moisture of the bread being baked. Several bakehouses nationally have been the subject of renovations, some have been converted into cottages or coffee houses, but some are being restored to their original state, often with a view to firing them up once again. One local restoration that is underway is the Community Bakehouse located in the Leicestershire village of Coleorton, just west of Ashby-de-la-Zouch. It is believed that the building may have been erected around 1813 by Sir George Beaumont as a resource for his tenants in the village. Details of the restoration can be found on the Coleorton Parish Website. In the past two decades there has been a world-wide resurgence in the production of artisan food and drink, and this includes breadmaking. New communal bread ovens are being constructed all over the world and are effectively becoming "village ovens" which hark back to the rustic, low-cost origins of this communal activity when gathering around fire, and making food was central to any culture. In the words of Kiko Denzer, author of Build Your Own Earth Oven, "Everyone is in the kitchen, and everyone is outdoors in nature."